When the Christmas season rolls around I always have to feeling of "okay so what did I do last year" and I'm getting to the point where as I feel like I'm doing the same designs that everyone else is doing which are cute but are less fun for me now. Therefore I decided to do some designs with a more unusual coloured background and make the typical symbols of the season in miniature form, randomly scattered over the nail, all in CND Shellac. 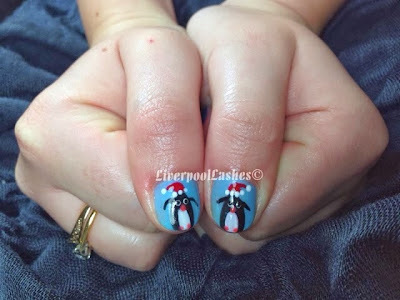 For the penguins I used: Mint Convertible, Black Pool, Cream Puff and Electric Orange. 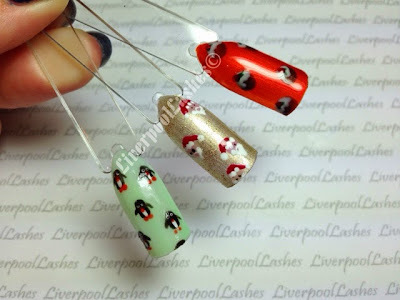 The Santas are: Locket Love (gold glitter patted into the sticky layer), Blush Teddy, Cream Puff, Black Pool and Wildfire. The Christmas puddings are: Fine Vermilion, Faux Fur, Cityscape, Serene Green and Wildfire. 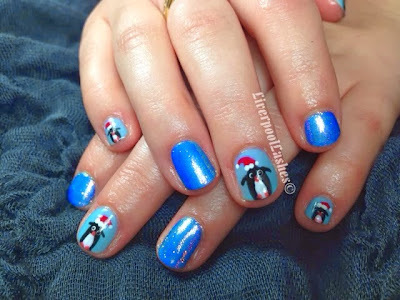 One of my favourite sets of Christmas nails were last year with a mix of Azure Wish, Waterpark, iridescent white glitter and penguins in Santa hats. It was a really fun design to do and every time I looked at them the Santa hats would make me laugh. I love the film 'Elf' so I wanted to do something else that was a little different to the typical 'Santa hats' that I see and came up with this one which so many people complimented me on.